Despite my cheese carving endeavors, I have never been much of a pumpkin carver. We do the basic monster faces every year, and even that is under some protest on my part. Having spent countless hours playing with the kids and their Darth Tater , I am however, really good at sticking plastic arms and legs into fake produce. Lots of people like Sci-Fi in small doses. Not us! Star Wars in big, giant wood-ladle-sized servings for us, please. Jedi Master Heidi’s case in point: She put her mad craft skills to use and made this too-funny centerpiece for our Mos Eisley’s Cantina (post to come this Friday). 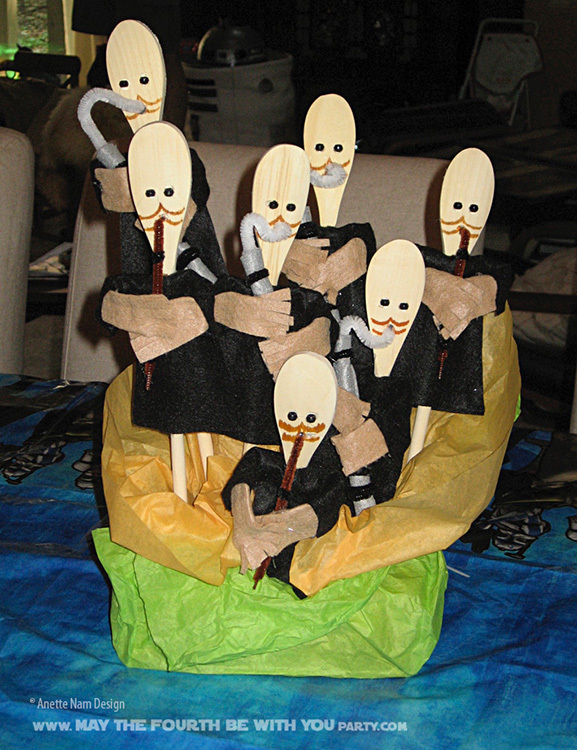 She used the wood spoon Bith (from the awesome book: The Star Wars Craft Book by Bonnie Burton), and designed a centerpiece that is (Star Wars) music to our ears.